America's Oldest Speed Shop®. Edelbrock Small Block Chevy Dual Quad Set-Up. Electric choke-equipped carburetors will not work on this 2-carb setup. Electric chokes will not release fast enough, causing the engine to load up, foul plugs, and stall before the choke fully opens. With manual chokes the driver can open the chokes as soon as necessary after the engine starts. With the huge fuel supply available from two 4-barrel carburetors, a choke mechanism is really not necessary but for a brief time. Air-conditioning bosses and front oil filler tube boss included. Stock alternator brackets do not fit. Port exit dimensions: 1.18" x 1.90". There is nothing sweeter looking or sounding than a dual quad on a Chevy! This one kit gets you two manual choke Edelbrock carbs, an Edelbrock unpolished intake manifold, fuel line and special progressive linkage. Just add a suggested air cleaner to finish your installation. (2) 500 cfm manual choke carbs. Low profile for hood clearance on most vehicles. Using the rear valley of the intake as a starting point it is. 3.433 to the bottom mounting surface. 6.640 to the ring mount on the carb. 7.553 to the top of the throat/highest point on the carb. The bottom of the intake valley to the highest point on some of our popular air filter assemblies. This looks fantastic on my old school 327. By Fatjack on January 04, 2017. Haven't got engine in car yet still detailing but if it runs as well as it looks it will be a winner. Yes, I recommend this product. Pedal to the floor baby. By Bigboystoys on January 17, 2016. By Jimbobby on September 23, 2013. This is a great setup once you dial it in... Great fuel mileage and when the second carb kicks in you know you did the right thing... By olrosa on August 12, 2011. Comes with everything you need. Related Items / Suggested Parts. Edelbrock 1235 Dual Quad Oval Air Cleaner. Edelbrock Chevy Vortec Dual Quad Set-Up. Lokar XTCB-40DQ Throttle Cable Bracket For Edelbrock Performer Carbs. Edelbrock Small Block Chevy Dual Quad Intake/Carburetor Kit. Fel-Pro Gaskets 1205 S/B Chevy Intake Manifold Gaskets, 1.28x2.09 Inch. Stainless Steel Small Block Chevy Intake Bolt Kits. Please pay for all items at the same time. We cannot combine your order if you have already paid. Not sure this part will fit? Speedway Motors is Americas Oldest Speed Shop® and has been a trusted source for specialty rodding and racing products and friendly expert advice for more than 65 years. Repack the item in a sturdy box, include a copy of your invoice and complete the form on the back of the invoice. All exchanges need to have reshipping charges included. Speedway accepts full responsibility for the accuracy of our listings and product representation. The item "Edelbrock Small Block Chevy Dual Quad Set-Up" is in sale since Wednesday, December 28, 2016. 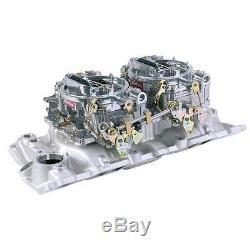 This item is in the category "eBay Motors\Parts & Accessories\Car & Truck Parts\Air Intake & Fuel Delivery\Other". The seller is "speedway_motors" and is located in Lincoln, Nebraska. This item can be shipped to United States, Canada, United Kingdom, Denmark, Romania, Slovakia, Bulgaria, Czech republic, Finland, Hungary, Latvia, Lithuania, Malta, Estonia, Australia, Greece, Portugal, Cyprus, Slovenia, Japan, Sweden, South Korea, Indonesia, Taiwan, South africa, Thailand, Belgium, France, Hong Kong, Ireland, Netherlands, Poland, Spain, Italy, Germany, Austria, Russian federation, Israel, Mexico, New Zealand, Singapore, Switzerland, Norway, Saudi arabia, Ukraine, United arab emirates, Qatar, Kuwait, Bahrain, Croatia, Malaysia, Brazil, Chile, Colombia, Costa rica, Panama, Trinidad and tobago, Guatemala, Honduras, Jamaica.